Barcelona has long embraced the arts, with some of Spain’s most influential figures hailing from Catalunya—most notably, the architect Gaudi, the painter Picasso, and the surrealist Dali. Here are a few ways to see the works of these iconic artists. Pablo Picasso honed his distinct style while living in Barcelona, and travelers can walk in his footsteps to some of the artist’s favorite haunts, including his art school and a cafe where he met with other notable artists of the time. To see a collection of his works, from when he was a child through his final years, visit the Picasso Museum in the Gothic Quarter. Antoni Gaudi’s numerous architectural marvels comprise some of Barcelona’s top attractions, including Park Güell, La Sagrada Familia, Casa Batlló, and La Pedrera. Sightseeing tours of Barcelona often stop at all four, but those who pay close attention to detail will notice hints of Gaudi all over the city. Dali’s birthplace of Figueres, a Catalan town just outside of Barcelona, is home to the fun and quirky Salvador Dali Museum, the house where he was born, and the cathedral where he was christened. Dali spent much of his time along the stunning Costa Brava, and travelers can combine a visit to the museum with an excursion to the Dali Museum-House in Port Lligat or the Pubol Castle, where the artist once lived with his wife, Gala. Immerse yourself in the world of Salvador Dalí, and learn about his life and works, on this day trip to Figueres and the Costa Brava from Barcelona. Admire paintings and other mind-bending creations by the 20th-century Spanish artist at the stunning Salvador Dalí Museum in his birthplace of Figueres. Then, tour his beloved Costa Brava to see some of his favorite places, such as the Salvador Dalí House in Port Lligat, and Pubol Castle, a later Salvador Dali home. Numbers are limited on this tour for a more personalized experience. Delve into the eccentric imagination of Antoni Gaudi on a combo tour that combines two of Barcelona’s most interesting experiences. Accompanied by a knowledgeable guide, sail past the long lines at the entrance of La Sagrada Familia with a priority access pass and marvel at the inspiring interior of the famously unfinished church. Afterwards, explore the sculpted splendor of Park Güell and stroll down Passeig de Gràcia to see Pedrera and Casa Batlló, two of the architect’s most distinctive and dynamic designs. Feast your senses on the multi-sensory magnificence of a 1.5-hour multimedia event within Gaudi’s La Pedrera. Immerse yourself in the unique majesty of an experience known as Gaudi’s Pedrera: The Origins and meander through the iconic landmark until you reach the rooftop, upon which a mesmerizing display of projections transform the architectural features into surreal and spectacular objects. Conclude your hypnotic evening with a chilled glass of cava as you admire the glittering lights of the city by night. Experience two of Barcelona's best-selling excursions during this 9-hour day trip, including a visit to the hilltop monastery of Montserrat, followed by an exploration of the modernist architecture of Antoni Gaudí, all at a discounted price. Begin your combo tour package by visiting the dramatic mountain religious site of the Royal Basilica of Montserrat, then spend the afternoon discovering the unique architectural creations of Gaudí. It's a great way to cover a lot of ground in a short period of time, with a bonus 5% discount versus buying each tour separately. Your excursion also includes a guide, all entrance fees and air-conditioned transport. 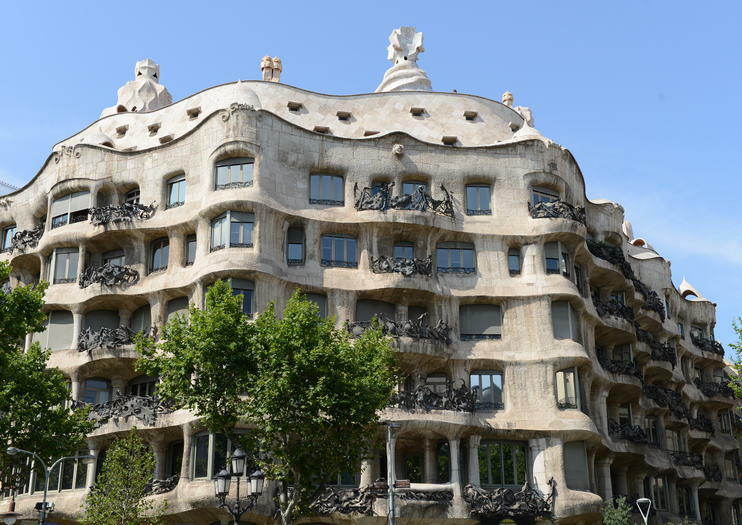 This 1.5-hour tour allows you to be the first one inside Gaudi’s La Pedrera – Milà House, 1 hour before the attraction officially opens to the public. With your priority-access pass, you’ll explore the modernist masterpiece in relative solitude until 9am. Capture crowd-free photographs of the UNESCO-listed landmark’s extravagant features and enjoy a coffee or a drink in Café de la Pedrera after your tour. Another perk: This tour is limited to 15 people. Enhance your experience of the Catalonian capital on a full-day sightseeing tour of Barcelona. Receive the undivided attention of your private guide as you visit legendary landmarks like Gaudi’s La Sagrada Familia, the atmospheric Barri Gòtic (Gothic Quarter) and the renowned La Rambla boulevard. Travel by luxury, air-conditioned vehicle and leave no stone unturned as you explore every inch of the city. Personalize your itinerary according to your interests and relish the flexibility of this private tour, on which pickup and drop-off from your hotel is included. Take a walk with Barcelona’s most famous modernist architects like Antoni Gaudí during this private 2.5-hour tour of the Catalan capital’s most iconic and lesser-known buildings. Explore understated architectural gems like Casa Lleó Morera, Casa Macaya, Casa de les Puntex, Casa Amatller and more . Best of all you’ll also explore Gaudí masterworks including Casa Batlló and La Pedrera. A knowledgeable guide and public transit tickets are also covered.